Weddings InStyle: Having trouble creating a signature drink for your special event? Having trouble creating a signature drink for your special event? There’s nothing better than arriving at a wedding reception and being greeted with a refreshing cocktail. But finding the perfect signature cocktail for your wedding sounds easier than it is. How do you make it original and personal at the same time? 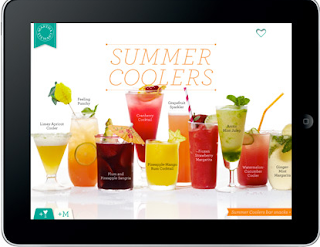 We’ve got a solution: Martha Stewart’s new iPad Cocktails App. Use it for weddings, bridal showers, engagement parties, even a Friday night! The App features a roulette-style recipe finder, letting you pick your cocktail by taste and liquor preferences. There are even “how-to” videos and detailed instructions. Not serving alcohol at your event? The app has Mocktails, too. Now for the hard part, which one will you make? Recipes for cocktails and tasty bar snacks from the new Martha Stewart Cocktails App for iPad, featuring spectacular photos, how-to videos, and drink-mixing tips. The Classic Cocktails bundle includes recipes for 20 cocktails and 5 bar snacks, with options to buy additional themed packages including regional favorites, cutting-edge drinks, summer coolers, and all kinds of tasty mocktails. The theme of your day – Whether it’s black & white affair, a beach party’ or ‘70’s retro-disco’, align your specialty libation with what your day will hold forth. Color – If this is a large part of your theme, consider it for your cocktails: Purple, pink, yellow, green, silver – all colors can be recreated in the liquid form. What liquor do I use? – Ask yourselves what your favorite spirits are, and decide from there. The possibilities are endless. A trend nowadays is back towards classic cocktails, so if you’re lovers of Gin, Rum, and Rye or Bourbon, think about using those as your base spirits. Garnish – Maybe it’s your favorite fruit or flower (make sure it’s edible! ), or just simply maraschino cherries. Always keep in mind what flavor your garnish will add to your cocktail. A garnish serves dual purposes – to look pretty and to add flavor to a drink. Remember – we taste with our eyes first. Save $$$ – By offering one or two specialty cocktails, you can limit your guests’ drinking habits. Even better, offer only your specialty cocktails during cocktail hour, and beer and wine during dinner. What those pregnant guests or ones who don’t drink? – Always have non-alcoholic versions of your alcoholic cocktails readily available for your guests. It usually just entails eliminating the alcoholic portion of the drink, and adding in a bit more of the mixers.